Down here in the Cape you always know Easter is just around the corner when a seasonal preoccupation takes hold of our beloved city; yes, I’m talking about our pickled fish obsession. It comes out of nowhere. Overnight supermarkets load tables with tubs of this sweet & sour delight, whole yellowtail is suddenly on the Specials board of your local fishmonger and, most tellingly, internet and food blog searches for pickled fish recipes sky rocket. All pickled portents that tell us one thing – Easter is upon us. 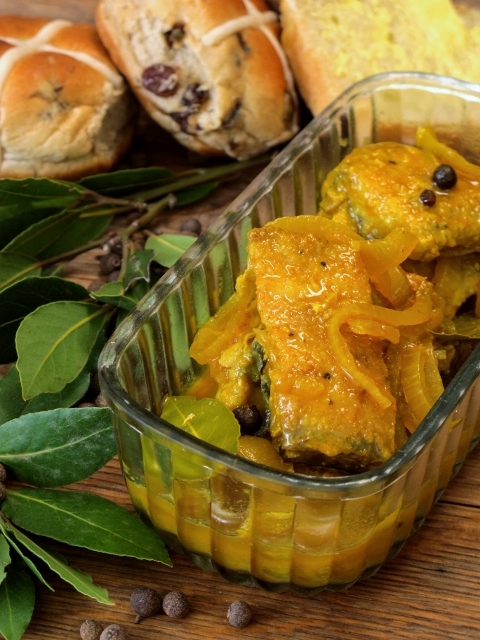 Before its association with Easter, pickled fish was simply a tasty way for the Cape Malay community to make the most of an abundance of fish during the summer months by preserving the fish – allowing them to keep the fish for an extended period of time. This classic Cape Malay dish is the perfect example of the heavy influence of Malaysian and Indonesian culture on Cape cuisine as the pickling liquid is more akin to a sweet and sour curry than any other methods of pickling fish. Traditionally snoek and yellowtail were the favoured catch as their dense flesh withstands the pickling process especially well, but flaker fish such as cob and hake can also be used although I prefer using yellowtail. Of course there is also the small matter of what you should serve your pickled fish with. The most common way is to simply have it with buttered white bread, but for those of you with a sense of adventure you can always try it with another Easter treat – hot cross buns. I know this might sound like a crazy and unappealing combination, but there really is method in this Easter mash-up madness. Call it an Easter miracle, but for some reason it really does taste amazingly good! Pickled fish and hot cross buns; yep, welcome to the true taste of the Cape.